The Complete Works of Shakespeare on CD rom. This application was originally written by myself for Cumana to bundle with A5000 computers to schools. A number of people still find it useful, even on much more modern systems, so I updated it to work with newer font managers and RISC OS 4/5, including Select. 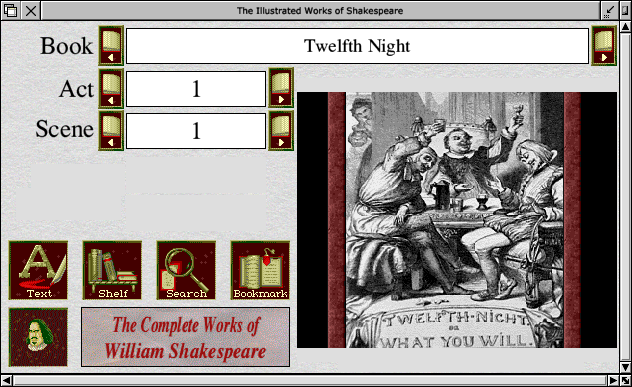 For those of you who don't have the original CD Rom (which I believe is no longer available, even from thee who hath it in stock), you can download the full data for Shakespeare, complete with illustrations. This is 16MB long as a ZIP file and extracts to approx 25MB. Download: ShakesData.zip [16M], downloaded 389 times. Contains complete text of all Shakespeare's plays, poems and sonnets. - Showing the main display window. If you find !Shakes useful, you may be interested in The Illustrated Holy Bible or Sherlock Holmes, which are also available as RISC OS multi-media applications. a) Loves Labours Lost bug fixed with RO 2 and 3.
a) 's' variables tidied up. wimpslot changed to 1024K. a) 1st occurance is gone to on search. b) escape now works on backwards search. b) error checking if picture file is too long. a) fixed eratic text after search. a) text centring bug fixed. a) Bookmark 'goto' bugs fixed.